The Indian Air Force has halved its demand for a new Russian-built advanced stealth fighter jet in a move to cut costs and reduce imports, India's Tribune News Service reported Tuesday, citing unidentified Indian military sources. With about 18 planes in each Indian fighter squadron, New Delhi's purchase of the developmental Sukhoi T-50 aircraft has been downgraded from a promised 127 aircraft to just 65, plus a handful of additional T-50s for training pilots to fly them, according to Tribune. 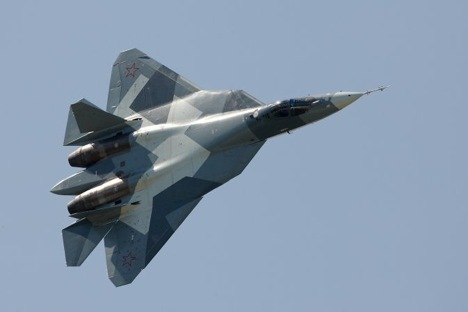 The new Sukhoi stealth fighter was co-developed by Russia and India, and has a reported price tag of $100 million per unit, according to Tribune. India and Russia finished development of a two-seat version specifically for the Indian Air Force in 2013, but have yet to finalize a contract for manufacturing and delivery of the new planes. The T-50 fighter is Russia's answer to the U.S. F-22 stealth fighter jet, and is the first new Russian fighter aircraft designed since the fall of the Soviet Union. It sports advanced electronics and sensors, can be used as a fighter jet or a ground attack plane, and is highly maneuverable. While single-pilot versions of the T-50 are expected to enter service with Russia's Air Force next year, Sukhoi's new jet has been dogged by diminished interest from the Russian government as well. In March, Deputy Defense Minister Yury Borisov said the Defense Ministry was curtailing its initial order of the T-50, which is scheduled to enter serial production next year, from 52 fighters to a mere 12. The Air Force will evaluate the performance of the first 12 fighters, and then decide how many the Defense Ministry can afford, Borisov said, promising that the military will continue to procure highly capable Su-35 multirole fighters for the next several years. The Su-35 is a post-Soviet modernization of the Soviet-designed Su-27 Flanker fighter jet and is Russia's current top of the line aircraft, noted for its extreme maneuverability. The Su-35 and other members of the Flanker family of jets derived from the older Su-27 are Russia's most popular military export items, according to newspaper Vedomosti. Vedomosti on Tuesday reported that the Defense Ministry will make good on its promise to Sukhoi to buy more Su-35 fighters at the upcoming MAKS airshow outside of Moscow at the end of August. Citing unidentified defense industry sources, Vedomosti said the Defense Ministry will sign a 100 billion ruble ($1.5 billion) contract for 48 brand new Su-35 fighters, which will keep Sukhoi's production lines busy for several years — the largest Russian fighter contract since 2012. Russia's United Aircraft Corporation, which owns Sukhoi, declined to comment on the Vedomosti report. All details will be announced at the MAKS signing ceremony, the company's press service said in an e-mail on Tuesday. Sukhoi is expected this year to complete deliveries of Su-35 airplanes ordered by the Defense Ministry under a 66 billion ruble ($1 billion) contract for 48 planes signed in 2009, when the aircraft were cheaper.